This is a great sauce to have in your repertoire – it works with all kinds of desserts. I love it with Pineapple Upside Down Cake. It keeps well in the fridge too, for use on ice cream, if nothing else. You can omit the rum if you wish; it still tastes wonderful. In a medium saucepan, melt the butter and add the sugar. Stir over medium heat until the sugar bubbles. Remove from heat and add boiling water gradually (BE CAREFUL – the steam is hot). Stir until sugar dissolves. Add the cold water to the cornstarch and stir till blended. 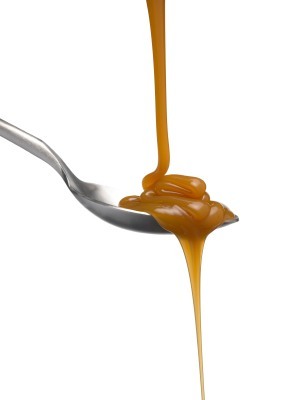 Pour into the caramel, stirring till thickened. Stir in the rum and set aside. Sauce can be re-warmed for serving, or stored in the fridge.